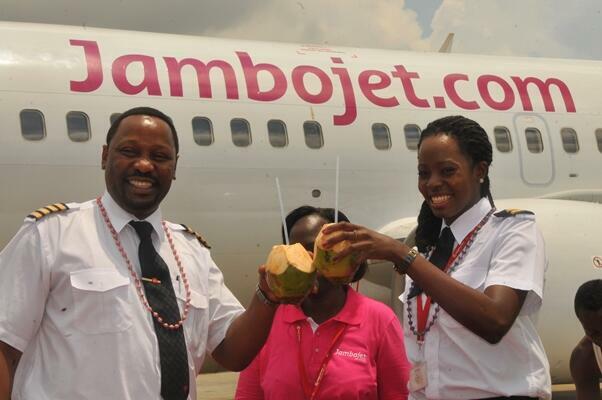 Jambojet (Jambojet.com) (Nairobi) has launched flights to three new destinations in the country’s coastal region, namely Lamu, Malindi and Ukunda. The first flights on the new routes took off from Nairobi’s Jomo Kenyatta International Airport on March 28. Jambojet launched the new service with a Bombardier Q400 turboprop chartered from DAC Aviation. 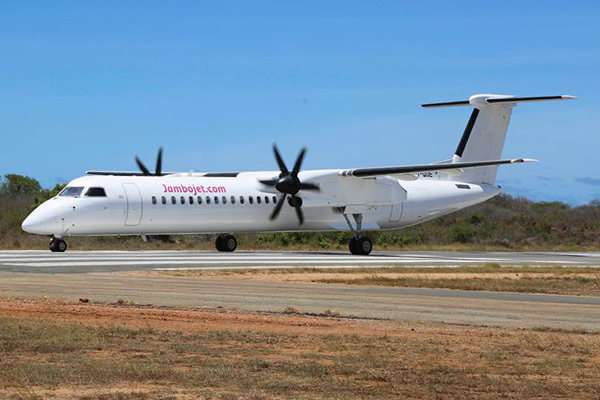 Jambojet, a subsidiary of Kenya Airways (Nairobi), has joined more than 50 owners and operators of Q400 aircraft worldwide. The airline is the second new operator to have adopted the Q400 aircraft in Africa in 2015, and has become the 19th member of the family on the continent. The new airline will commemorate its first year of operations on April 1. Jambojet also operates three Boeing 737-300s. This entry was posted in Jambojet and tagged Bambardier DHC-8, Bombardier, Bombardier DHC-8-400, Bombardier Q400, DHC-8, DHC-8-400, DHC-8-402, Jambojet, Jambojet.com, Q400 on March 31, 2015 by Bruce Drum. Kenya Airways (Nairobi) as a follow-up to our previous report last year, will move ahead and introduce its new regional subsidiary Jambo Jet later this year to compete against the rising number of lower cost carriers in Africa. This entry was posted in Jambojet, Kenya Airways and tagged aviation, Jambojet, Kenya Airways, transportation on June 19, 2012 by Bruce Drum. Kenya Airways Boeing 737-86N WL 5Y-KYD (msn 35632) LHR (David Apps), originally uploaded by Airliners Gallery. Kenya Airways (Nairobi) has registered the name “Jambo Jet” for its new low-cost subsidiary. Jambo Jet will compete against other low-fare carriers on domestic and regional routes in Africa. Copyright Photo: David Apps. Please click on the photo for additional information. This entry was posted in Jambojet, Kenya Airways and tagged Jambojet, Kenya Airways on August 10, 2011 by Bruce Drum.